Timothy B. Smith’s latest work on the Civil War in the Western Theater, The Real Horse Soldiers: Benjamin Grierson’s Epic 1863 Civil War Raid Through Mississippi, tackles the larger than life Benjamin Grierson raid through Mississippi in April and May 1863. Made famous by the John Wayne film The Horse Soldiers, Grierson’s Raid so occupied Confederate commander John Pemberton that he completely lost track of what Ulysses S. Grant was doing on the Louisiana side of the Mississippi River. Ultimately, though Grierson’s Raid was not the only deception Grant threw at Pemberton in this time frame, it was the most spectacular in its damage, endurance, and ultimately its contribution to Grant’s Vicksburg victory. Author Timothy B. Smith long ago became a personal favorite author of mine. He has worked in the National Park service system and currently teaches at the University of Tennessee – Martin. I prize my copy of his book Champion Hill: Decisive Battle for Vicksburg, which was my first exposure to his work. Over the past decade plus, Smith has been steadily working on the famous battles of Grant’s Army of the Tennessee, including multiple books on Shiloh, Vicksburg and the first National Military Parks from the Civil War, as well as single books on Forts Henry and Donelson, the Battle AND the earlier Siege of Corinth, among other topics. Over the years, Grierson’s Raid has evolved into a legend, with distorted or exaggerated facts. Dee Brown (of Bury My Heart at Wounded Knee fame) wrote a book in 1954 called Grierson’s Raid which, per author Smith, took “liberty with the facts and sources…in a manner no academic historian would allow.” In fact, Smith intentionally kept himself from reading Brown’s novel prior to finishing this book so as not to contaminate the primary sources in his own mind. Novelist Harold Sinclair penned The Horse Soldiers in 1956, where he used “the historic raid as its basis, but…made up conversations and events.” Shortly after Sinclair’s novel, the 1959 John Wayne / William Holden film of the same name came out. There have been other books as well, including a popular history paperback by Tom Laliki as well as an entry in the Osprey raid series (#12). Not too many years ago I reviewed a book on TOCWOC called Fiction as Fact: The Horse Soldiers & Popular Memory by Neil Longley York, published by Kent State University Press. In that 2001 book, York calls Dee Brown’s book the best non-fiction account of Grierson’s Raid. Thanks to Tim Smith’s new book, this is now an inaccurate statement. Grierson’s Raid occurred from April 17-May 2, 1863, starting at La Grange, Tennessee midway between Memphis and Corinth, and ending at Baton Rouge, Louisiana. Grierson had three regiments, the 6th and 7th Illinois and the 2nd Iowa. Generals Hurlbut and William Sooy Smith, along with Grant and Grierson, were involved in the pre-raid discussions. In fact, Tim Smith writes, Grant’s plan all along was to distract Confederate commander John Pemberton with feints and raids of this nature to distract from almost missed the raid, only returning from a leave of absence hours before it was to begin. On April 17, 1863, Grierson led 1,700 cavalrymen from his Illinois and Iowa regiments forward out of La Grange. Their main objective was Newton’s Station on the Southern Railroad of Mississippi. This railroad ran west and supplied Vicksburg through Jackson, Mississippi, so it was an important point for the Confederates to defend. Moving fast, using scouts disguised as Confederates, and sending portions of his command on large and small feints, Grierson managed to reach Newton’s Station on April 24, 1863. To Confederate observers, he had appeared like a lightning bolt out of nowhere. In his overage of the results, Tim Smith writes that the actual physical damage wasn’t all that great at Newton’s Station, though other country bridges Grierson had destroyed remained unrepaired until after the war. The real result, writes Smith, was that Grierson so completely occupied Pemberton and the Confederates that it helped Grant to successfully cross the Mississippi River south of Vicksburg and embark on the successful end stages of the Vicksburg Campaign. The maps were very good in the book, something ESSENTIAL for a book on a cavalry raid. You literally cannot have enough maps in a book of this type. Very few get it right. Tim Smith did a very good job here. The text tied to the maps well, and I rarely (though there were a few instances) found myself wondering where the map was for what was being described. Smith also goes into great detail on the how the plan evolved over time, who was involved, and who should get the credit for its conception. I won’t spoil the author’s conclusion, but two men stand out as deserving the most praise. A lovely feature at the end of the book covered what happened to the raiders and their pursuers after the Civil War, with an obvious focus on Grierson. 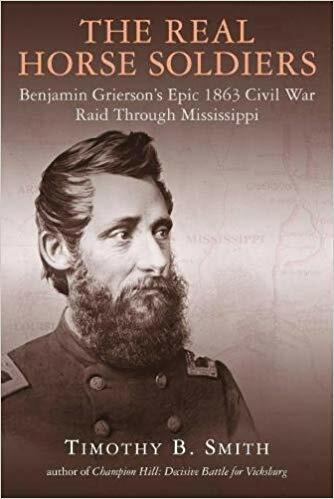 Despite many books being written on Grierson’s Cavalry Raid through Mississippi in 1863, Timothy Smith’s new book The Real Horse Soldiers: Benjamin Grierson’s Epic 1863 Civil War Raid Through Mississippi finally presents the facts without unnecessary exaggerations. The truth, as Smith is quick to point out, is more than fascinating enough. Obvious readers will be those interested in the Western Theater in general, in Grant’s Army of the Tennessee (a Smith specialty), the Vicksburg Campaign, and cavalry operations during the war. If you want to read about the single greatest cavalry raid of the entire Civil War, you want this book. It is one more feather in the cap of Tim Smith, whose cap is getting fairly full of feathers at this point. This book was provided gratis for the purposes of this review. You’re welcome Ted! I’ve been meaning to get to this one for a good long while. I knew it was going to be a good one. Thanks for the info. Feel free to leave links in the comments. That’s fine with me. Nice review. I have this book in my recommended list on Amazon and am thinking of getting it, so this definitely helps. You noted some of the other works on the raid, but have you read Just and Righteous Cause (SIU Press, 2008), which is Grierson’s memoir? I have a copy of it that I picked up at Jacksonville’s Grierson Days festival several years ago, when I visited it while visiting my folks during summer. If you have the time, there’s a nice reenactment event going on down by Pinckneyville the weekend of Palm Sunday. I am going to be visiting my folks at that time and am going to check it out for the day, as it sounds like a good time. Again, great review and take care. Thanks! I actually haven’t read his autobiography, which is doubly embarrassing, because I live maybe 90 minutes from SIU’s campus. I will make a note of that reenactment. My sons aren’t into history at all, and I’ve been thinking of ways to introduce things to them so it’s not in book form. Brett: Nice review. I have it but haven’t gotten around to more than skimming yet. It looks as if Tim has hit another one out of the park.